Identifies the ephemeral province of 'Stickeen' in the modern day Yukon. 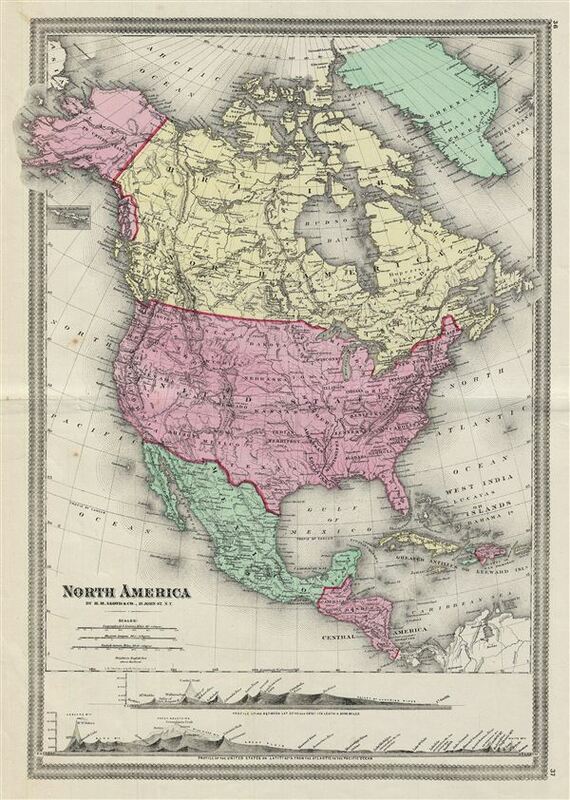 This is a fascinating example of the 1862 H. H. Lloyd map of North America. Centered on the United States, covers from the Arctic Ocean to Panama, including Greenland and parts of South American and the West Indies. A tiny inset map in the upper left quadrant depicts the westward extension of the Alaska Peninsula. The maps lower quadrants contain an elevation profile of the United States from the Atlantic to the Pacific Ocean and another of the lands between latitude 33°43 and 38°01. Oklahoma is identified as the 'Indian Territory.' Although the map is undated, we can assign an approximate date as this is one of the rare maps to identify the 'Stickeen' territory in British North America, only in existence between 1862 and 1863. Map is hand colored to define national and regional boundaries. Prepared by H. H. Llloyd and Co., New York as plate nos. 36 and 37 for the 1862 edition of the Atlas of the United States. H.H. Lloyd & Company (fl. 1860 - 1890) were 19th century American map and atlas publishers based in New York City. They should not be confused with the competing New York firm with of a similar name, J. T. Lloyd, with whom H. H. Lloyd had a ongoing conflict. The firm was founded by H. H. Lloyd and Benjamin S. Demarest in 1860. The H. H. Lloyd firm published numerous atlases, wall maps, and gazetteers before, during and after the American Civil War. These include some of the best maps of the period, many of which were used as battle plans by various Civil War generals on both sides of the conflict. From various offices around the city, the H.H. Lloyd firm worked with other prominent firms of the period including H. S. Stebbins, Warner and Beers to produce numerous state and county atlases. Around 1880 Demarest took full control of the firm, possibly suggesting that Lloyd either died or retired. Though H. H. Lloyd and Company continued to produce maps well in to the 1880s, the firm lost much of its momentum and eventually, by 1890, closed its doors. H. H. Lloyd is sometimes confused with J. T. Lloyd, another map publisher of the period who produced a small number of United States and regional maps sympathetic to the Confederacy. Both H. H. Lloyd and B. Demarest were Union supporters, Demarest having served as a Major in the Union Army. Lloyd, H. H., Atlas of the United States, 1862. Very good. Original centerfold visible. Minor wear along centerfold. Verso repair near the centerfold.